Arriving like a breath of fresh air amidst this summer season, the first stellar teaser for Alejandro González Iñárritu‘s Birdman has us counting down the days until October. A sure bet for the fall festival season, the dark comedy follows Michael Keaton as a once-famous actor known for an iconic, eponymous superhero role. Today brings a new look at the project as well as some exclusive details surrounding its ambitious execution. As set across a 48-hour period while Keaton’s character attempts to mount a Broadway play and reclaim his personal life, it will be a far more immersive experience than one might have imagined. Cinematographer Emmanuel Lubezki, coming off Gravity, has helped Iñárritu devise a film that will appear to be accomplished in one extensive sequence. According to multiple sources who saw the film earlier this spring, the effect is akin to Alfred Hitchcock‘s Rope, with seamless segues of CGI and black spaces stringing together no more than a dozen single shots in one long, continuous sequence. While we must note that these stem from a test screening, our sources say the feature seems finished, and it’s difficult to imagine cutting down the carefully constructed film. When it comes to narrative, we’ve learned it, somewhat unsurprisingly, is very self-referential in terms of Keaton’s career, commenting on the absurdity of fame as well as leaving one’s legacy in their craft. While there are a few funny moments, our sources indicate it’s mostly dramatic fare with some unexpected elements (i.e. supernatural telekinesis) thrown in. So, less than a year after Gravity, it looks like we could expect something perhaps even more ambitious from Lubezki. In the meantime, check out new images above and below. 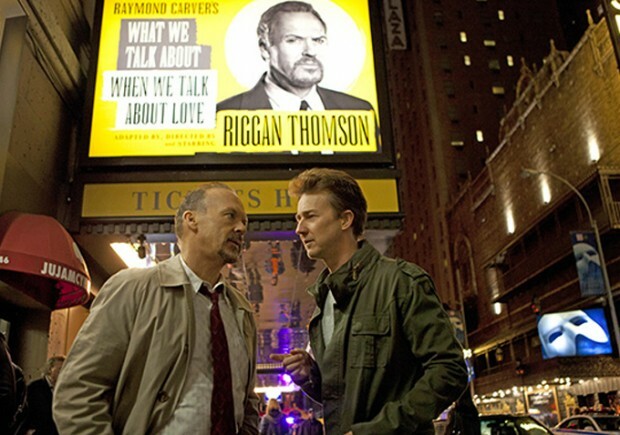 Birdman, also starring Lindsay Duncan, Zach Galifianakis, Edward Norton, Andrea Riseborough, Amy Ryan, Emma Stone, and Naomi Watts, opens on October 17th.